Ankle scarves! What a ridiculous trend! 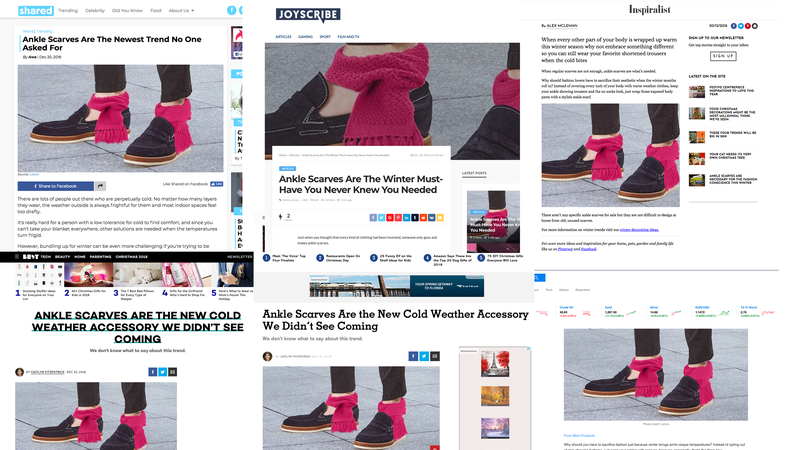 Twitter users are asking each other how something as dumb as “ankle scarves’ could be real. ” Well — and I’m afraid to reveal this, because so many real media outlets are falling for it — it’s not real. It’s an obvious joke. Here’s how it got laundered into a “crazy trend” for everyone to laugh and be outraged at on social media. Some of you have already noticed that the scarves in the picture are Photoshopped. That’s because there is no ankle scarf trend. I’m not saying that there’s really only one person who once wore tiny scarves on their ankles. I’m saying that the photo comes from this joke article on the German satire site Der Postillon. See, Der Postillon published a joke article that teens in Berlin are wearing scarves around their ankles, to stay warm while wearing fashionably short pants. Then the Italian satire site Lercio syndicated that article. Lercio isn’t pretending to be real any more than Der Postillon is; the front page includes stories about a hermit hiding inside his mailbox, and the pope fighting over parking spots for the Popemobile. The better-known outlet Country Living then syndicated this post word-for-word. The blog for radio station mix 105.1 also aggregated the story. Both publications tweeted the story with incredulous captions. For the story to get this far, multiple people had to ignore some obvious warning signs. The BestProducts.com blogger might not have looked at any other page on Lercio, the satire site. But she still linked to the source, which means everyone who spread the story failed to check to see that the source was satirical. 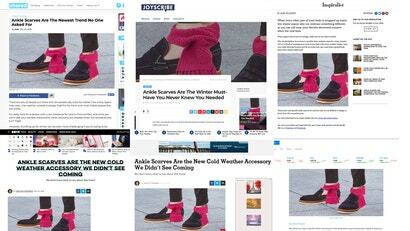 They also had to ignore the fake-looking picture of “ankle scarves” as they copy-pasted it onto their own sites. But no one has time for that. And there’s plenty of motivation to not check, when you’re having so much fun mocking fictional people for wearing fictional ankle scarves. In his essential essay “False Witnesses 2”, Fred Clark refers to the “Anti Kitten-Burning Coalition.” This is the group of people who, upon hearing the terrible news that someone has burned a kitten, speak out bravely to inform the world that they, personally, are against kitten burning. This accomplishes nothing, since almost everyone is against kitten burning, and that didn’t stop the kitten burners. It only gives the speaker a false sense of moral superiority. And if no one’s actually burned a kitten lately, the Anti Kitten-Burning Coalition tends to make up a few cases they can get mad at. What you see with the “ankle socks trend” is the much more innocent version of this. The internet finds a target we can all agree on, and suddenly it doesn’t really matter if the target actually exists. In this case, instead of a heinous crime, it’s a fashion crime—an acceptable target that stands in for everything we hate “hipsters” and “millennials” for doing. We all get to feel superior to those fictional trend worshippers buying scarves for their ankles. And because feeling superior feels so good, we hate to get called out on it. Just try to point out the truth to someone in those Twitter threads making fun of ankle scarves. There’s a good chance they’ll yell at you, say that’s not the point, the point is those frickin’ Brooklyn hipsters!!! They’ll defend their bit of fun and they will not like you coming in and trying to make them feel foolish. 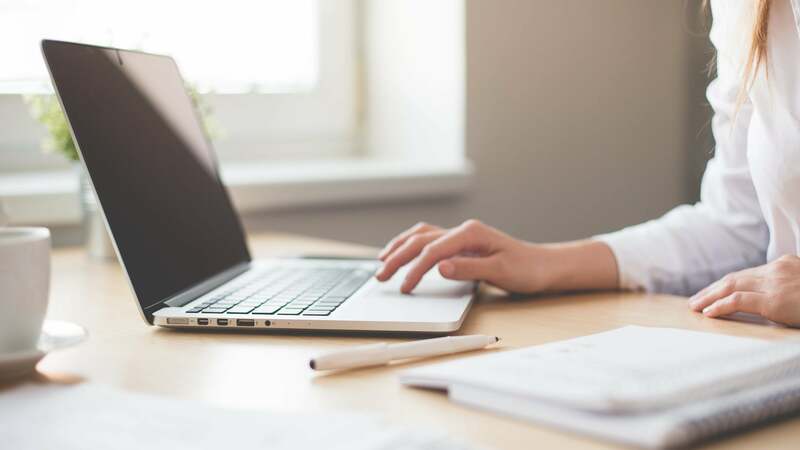 But don’t laugh at them — unless every time you come across a news story, you’re ready to click through to the source. Let’s be honest; you don’t have time for that. Some day, it’ll be you who falls for the hoax. Hahahaha! Just look at it.